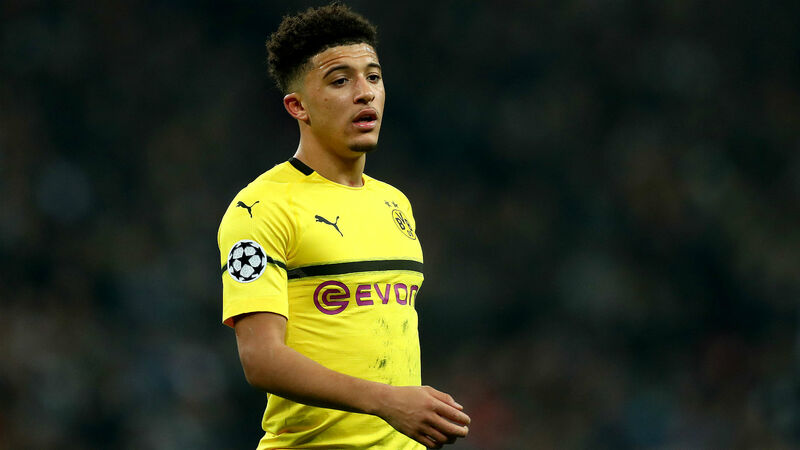 Jurgen Klopp confirmed Liverpool were interested in signing Borussia Dortmund sensation Jadon Sancho when he was at Manchester City, but the Premier League champions would not sell to the Reds. Sancho left City for the Bundesliga in August 2017 and has been a revelation in Germany, scoring seven goals and setting up another nine in 22 league matches this season. The 18-year-old earned his first senior England caps towards the end of last year and already looks as though he is set to become a mainstay, such is the talent he has shown early in his career. Sancho arguably would not be in such a position had he stayed at City, however, as he decided to leave in search of greater exposure to first-team football. Had things gone differently, he could have even ended up at Anfield. "Buying English players is a smart idea because we would never have a chance to get Sancho," Klopp told reporters on Monday ahead of Liverpool's Champions League clash with Bayern Munich. "No, because English clubs don't sell to other English clubs. I don't know exactly what the reason is for that, but they don't do it." Eager to not miss out on another English talent after seeing Sancho go to Dortmund, Bayern have made no secret of their desire to sign Callum Hudson-Odoi of Chelsea. Some have suggested Bundesliga clubs' interest in young English players is a consequence of a perceived lack of talented German youth players, though Klopp is unconvinced. "There is no dip," he said. "Six or seven years ago you had all these boys coming up – Marco Reus, Andre Schurrle, Mario Gotze, Thomas Muller, Mats Hummels – and it was clear when they became Under-21 European champions it would be a generation of proper quality. "England now has that situation. It is like a wave with one country a little bit up and another country down. Now they can go to Germany, which is a wonderful league. "I saw the Dortmund game against Tottenham and it was a completely open game in the first half. I don't see German football in a bad situation. "It is a normal situation as well, a bit like Bayern. They have been unbelievably successful and now the next generation has to come up. "That will happen again. The Bundesliga is a fantastic league and everything will be fine for them, but at the moment I am in the Premier League and more interested in what we have to do here."